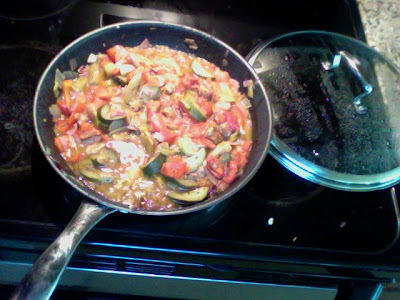 I made this the other day, with fresh garlic, onions, squash, red onion, tomatoes, leeks, peppers and herbs de provence (with thyme, marjoram, rosemary, basil, fennel, sage and lavender) lovely it had a ratatouille flavour to it. little Jasmine loves squash so try and make it often. Oh and I mailed my check to get a share in a local organic farm (CSA- Community Supported Agriculture) I collect my first box on thursday how exciting. I read so many food bloggers who do this and it really inspired me, fresh local produce, can't get better than that. I am also hoping it saves money on my grocery bill as it equates to $28 a week, not bad.